OUR JOURNEY * LAUGH LOVE RUN REPEAT * I RUN WITH HEART * Unogwaja - cecifromtheblocks Webseite! We have changed. 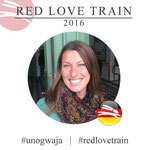 We joined the Red Love Train. 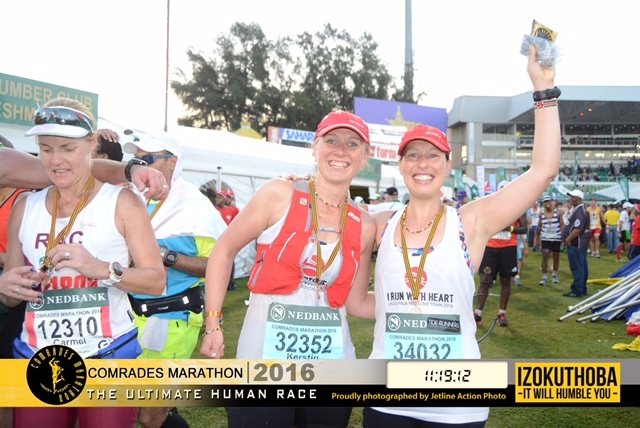 We ran the Comrades. humans and we fell in love! 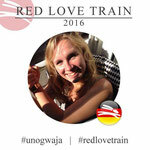 The official birth of the ‘Red Love Train’ was in 2013. 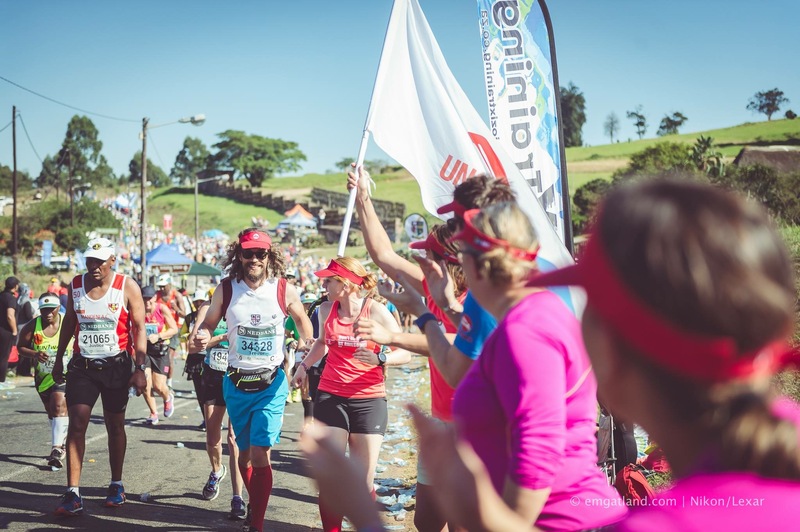 A term the Unogwaja Team became known for as for the ‚amount of fun, positivity and love that exuded from the group during Comrades’. 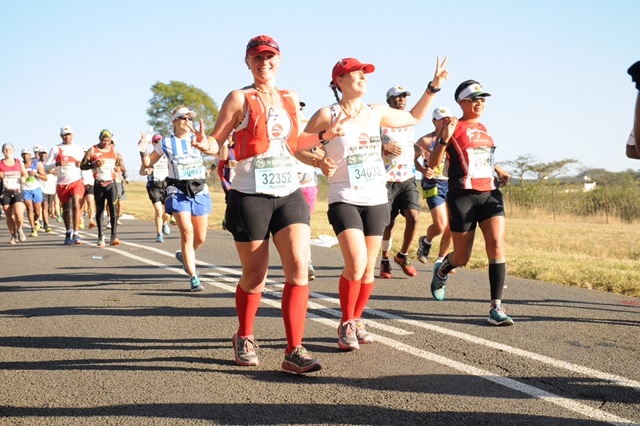 To become a member of the Red Love Train you are not only participating in Comrades ultra marathon, no, you also run it for a good reason: you proudly wear your Red Socks alongside like-minded incredible human beings from all over the world, you run alongside the athletes of the Unogwaja Challenge and you raise funds for the Unogwaja Light Fund – you are part of Unogwaja! The core of the Light Fund stands for: ‘the willingness to support, enable and empower those people who have not given up hope and who are already doing their best to make it better for themselves and the people around them, regardless of their circumstances’. The fund enables education. Education is the most powerful weapon which you can use to change the world said Nelson Mandela. The Lightfund supports three wonderful community projects and its focus lies specifically in giving education, skills development and the chance to help people to help themselves. 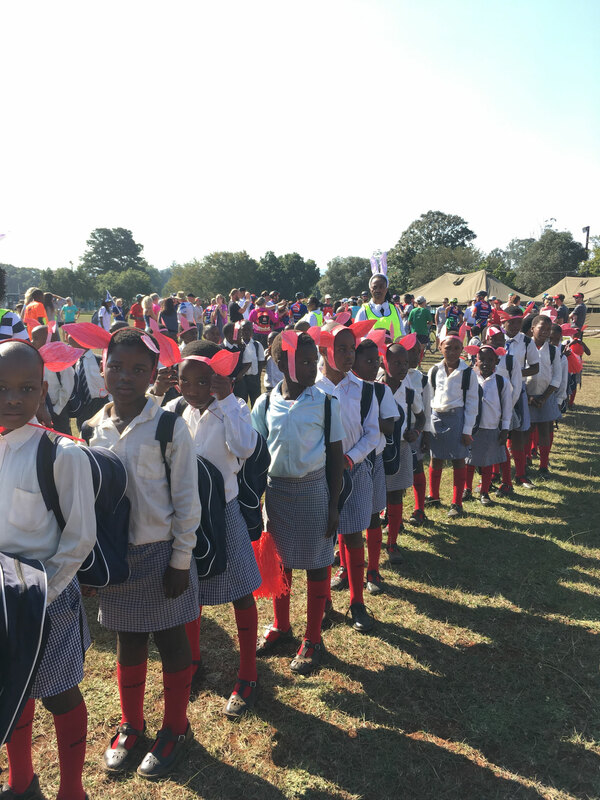 This year the Red Love Train raised funds for the Umsilinga Primary School in Ezinktheni. 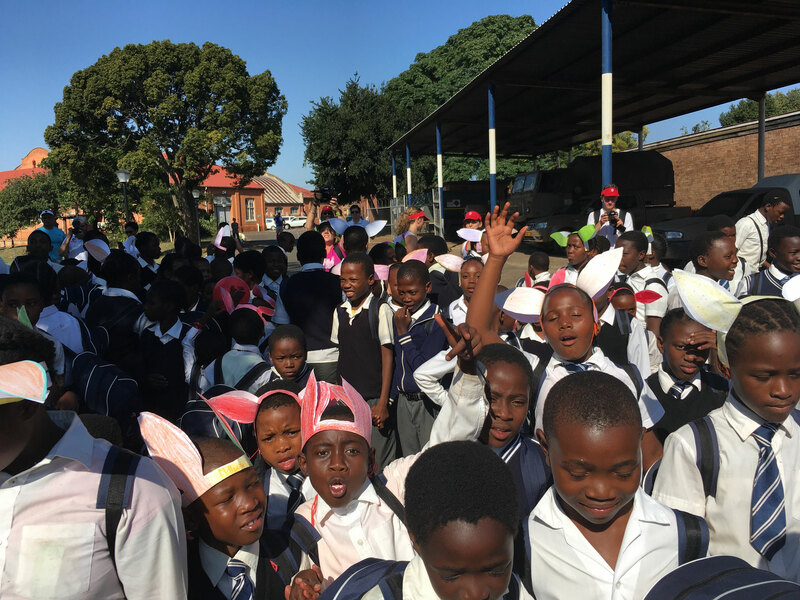 A school 10 minutes away from Pietermaritzburg visited by 1.200 students. 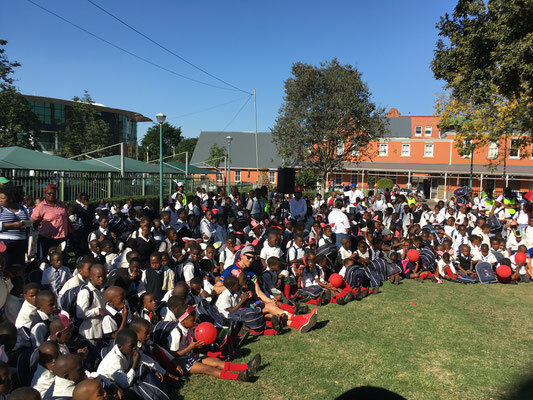 The school needs class rooms. That is important for them and their teachers. 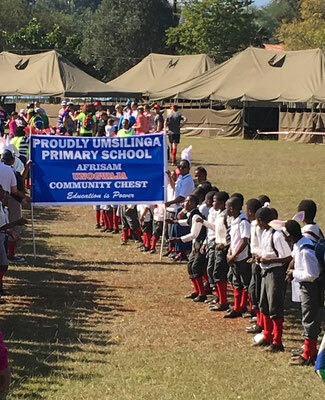 For most of the children their school is their only hope into an unknown future. Finally meeting those kids was an encounter I will never forget in my life. ❤️. With our red socks in our luggage we finally got on the plane. Destination Durban. Having trained through a rough German winter with tons of cold dark running sessions, snow, hail and rain we managed to collected over 1.577 km in 5 months. No injuries and with sun in our hearts – it was awesome we never had to train alone. 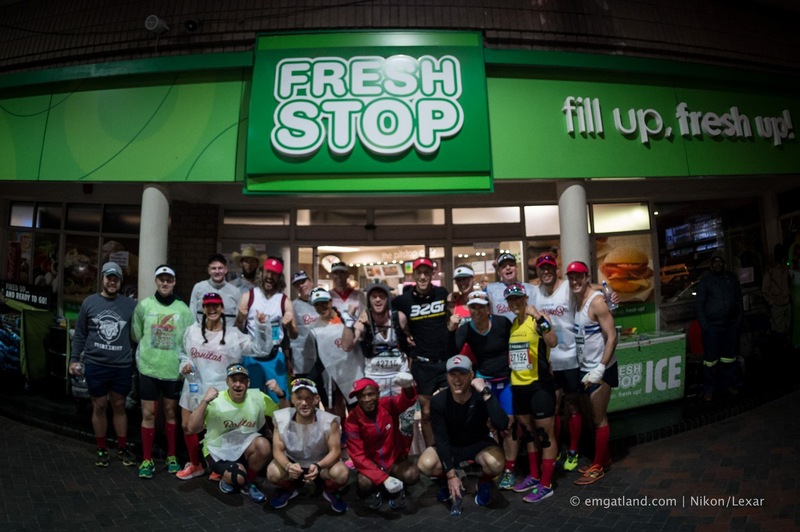 A lot of people of our running crew, Tide Runners Hamburg, decided to run ultras this year. Togehter we are stronger - so true! 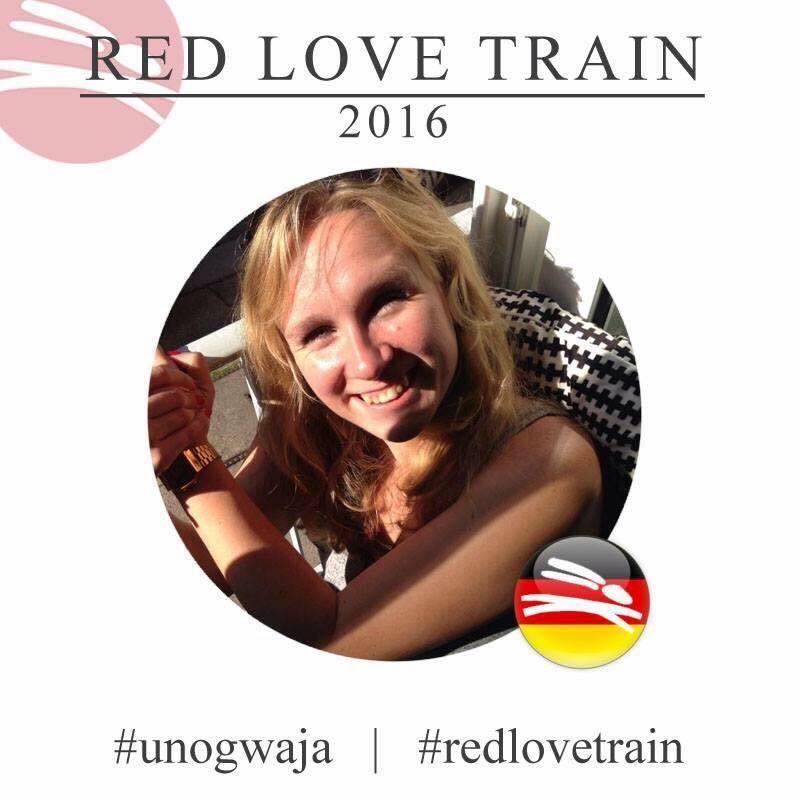 Once I had made the decision not to do the Unogwaja Challenge in 2016 we were all united in the Red Love Train. Looking back I have again learned that taking a ‚step back’ made me `move two steps forward`. What seemed to be hard turned out for the best. One discovers later what decisions are good for – you just have to accept them and keep on walking ... I am still thankful for the wise advice of a very special person – thank you Stoff! 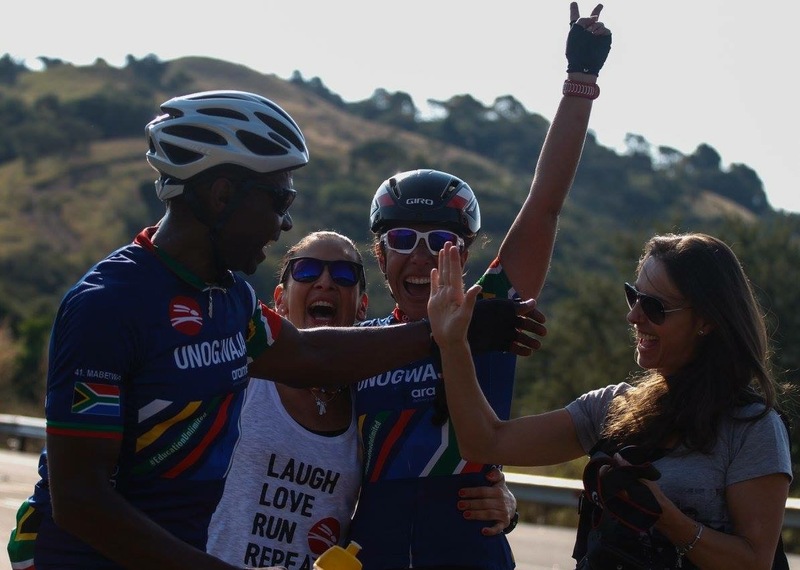 Being a participant of the Unogwaja Challenge is never about oneself – its about a team of 12 individuals achieving something together. Sometimes life decides to lead you towards other roads... Many lessons have taught me to take life as it comes and my positivity has always helped me through. I have a strong belief that you need to be able to listen to your heart and follow that path – it takes you to the places and people you belong to! I guess I got Kerstin and Elkes ‚infected’ with my Comrades story of 2014 just like Florian Hostein 'infected' me with the Unogwaja... I told everybody about the spirit of this race. 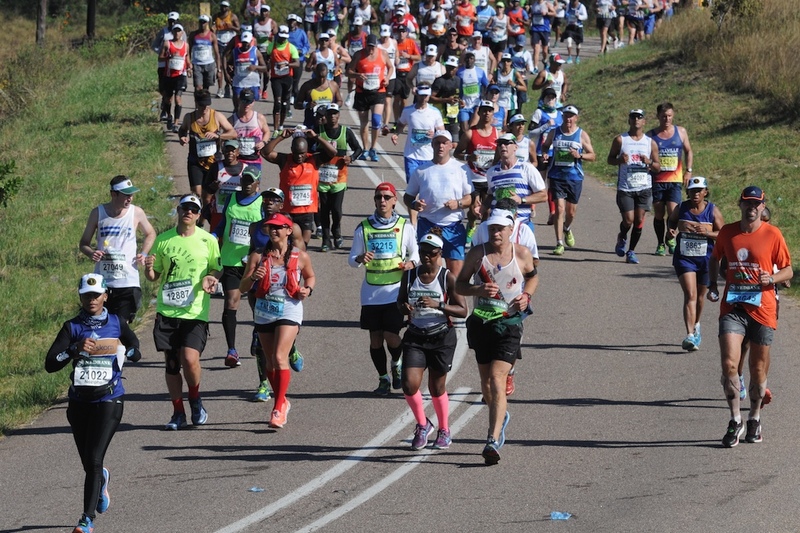 I had never experienced a marathon like this before. Back then my kids and I had raised over 5.000€ for our local childrens hospice in Hamburg. We sold cakes and bracelets, did sightseeing runs etc. I wanted to teach them that you can achieve big things in doing small things. We can make a change if we only want. With them on my mind I had all so much willpower in me. Endless energy. 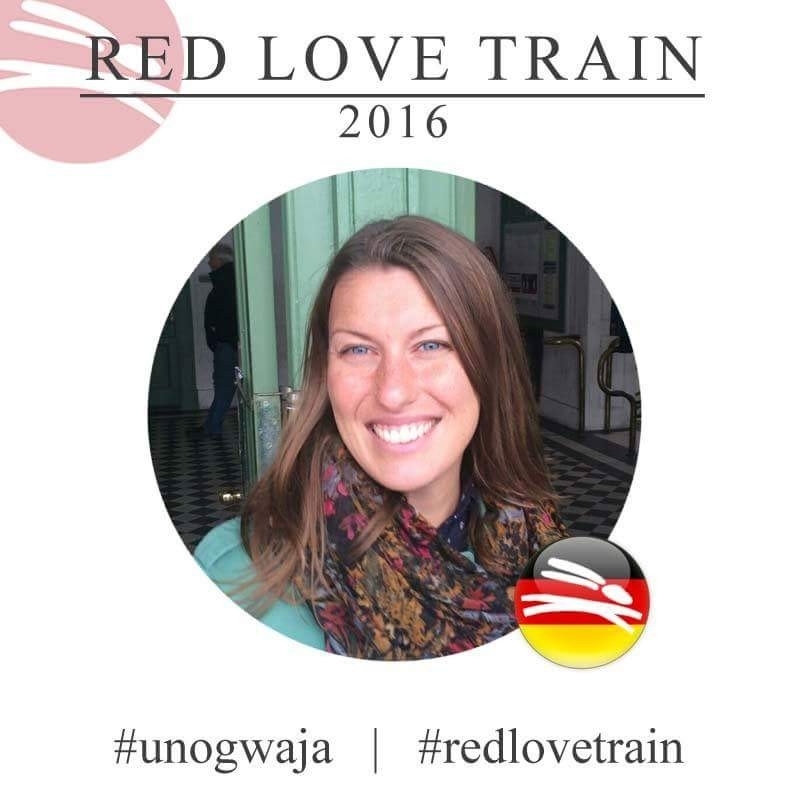 Kerstin was the first to sign in for the Red Love Train – Elke followed by the end of last year. 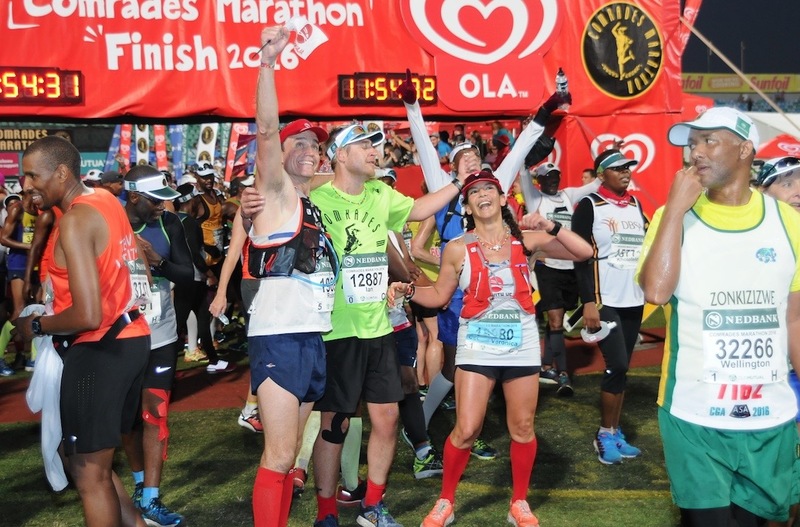 I can only repeat how incredibly proud I am as only last year I had coached them through their first marathon and now they would go for Comrades – a huge step! 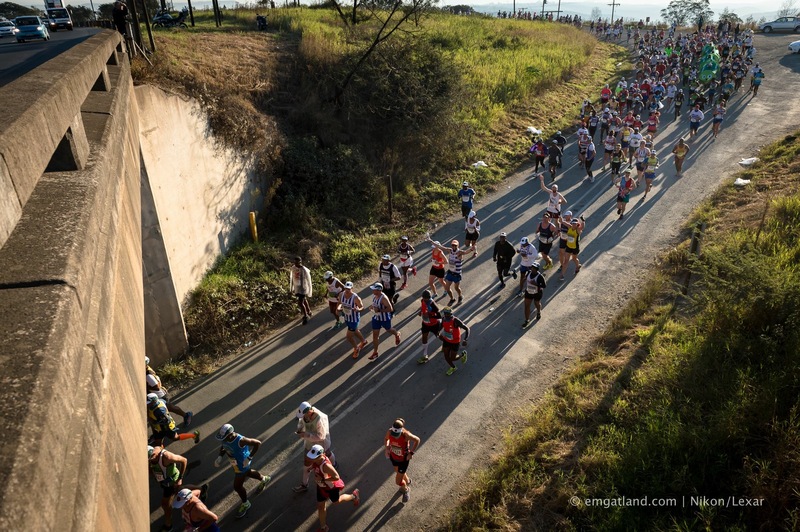 Last November we sat down made our planning, I provided our training plan and explained the difficulties of the race. It requires a good physical prep but even more important: the mind has to be prepared! After picking up my race number I met Nato Amaral. 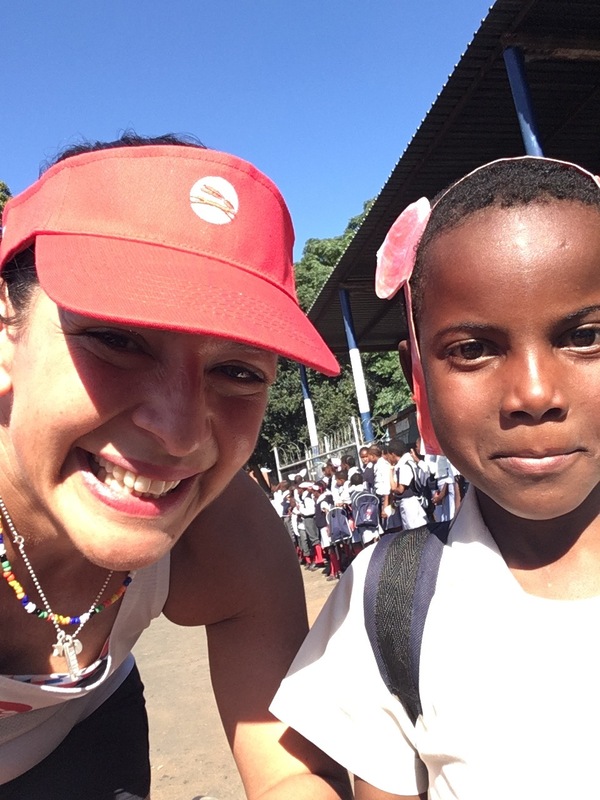 Brasil Comrades ambassador and well known Unogwaja - he had done the challenge twice, last year as their team lead. 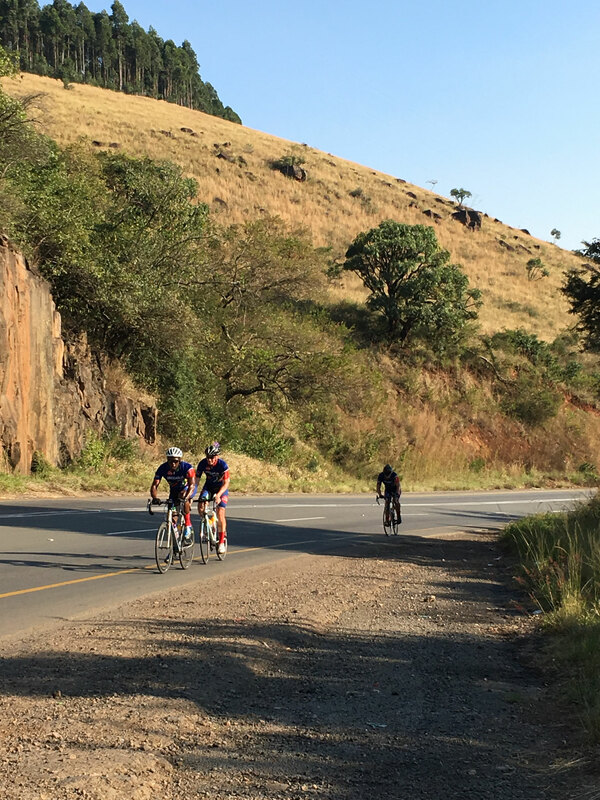 He drove us to Pietermaritzburg and took us to ‚Umkomaas Pass’. 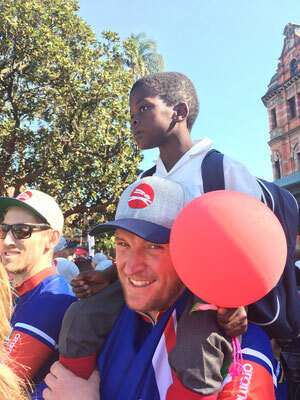 The surprise plan was to wait at the top to surprise the 12 brave Unogwaja Challenge athletes. I was super nervous (good nervous) as I grew with that team for the last 7 months chatting via whatsapp, skype calls and writing emails. 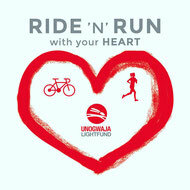 We all did our fundraisers for the Unogwaja Lightfund. Wow - Umkomaas Pass, with its 3.217metres of elevation above sea level looked scary. Approximately 2-3k´s of heavy climbing the curvy roads with very scary traffic. As we got there, three Unogwajas had already reached its top – we were late but it still was an awesome surprise – one by one had made it up that hill and I could read their faces. 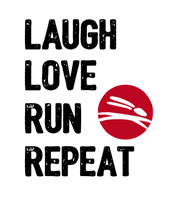 Relief, happiness, pain, happiness...!! Seeing them all was very important to me and one of the most beautiful encounters I have ever had. So many months I was looking forward to finally hugging everybody. For me our reunion was like seeing family members – a very very happy moment. 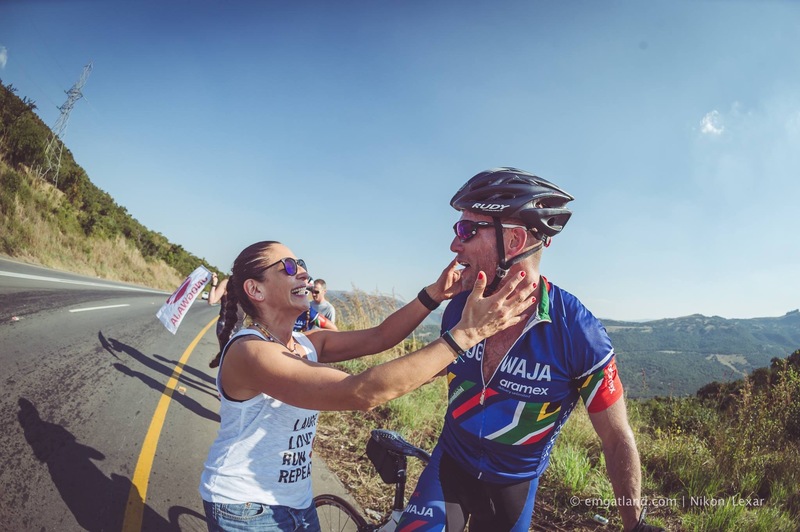 They had nearly finished their incredible journey cycling from Cape Town to Pietermaritzburg within 10 days (1.700k with 20.000m of elevation) and having the Comrades ahead on day 11 was certainly no piece of cake... an incredible journey of giving hope to others and achieving what they had put in their hearts. I was very thankful to join the team on this o part of their journey. 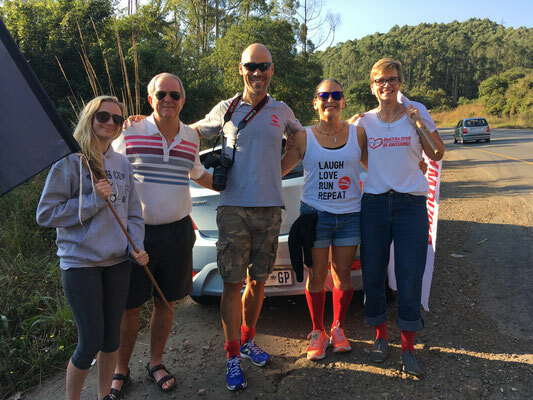 We´d all stay at the Carbineers in Pietermaritzburg. A beautiful experience. 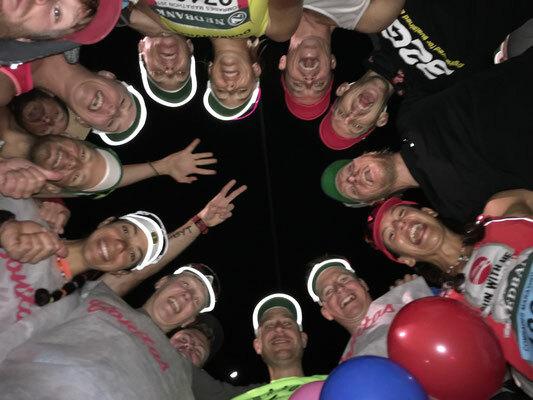 I had finally met these champs plus the world´s most amazing support group and of course John and Stoff – people who´d give everything for others. I instantly fell in love with these beautiful people! The Unogwajas had left for their last day of cycling. When suddenly the sweet noise of children´s laughter came up. 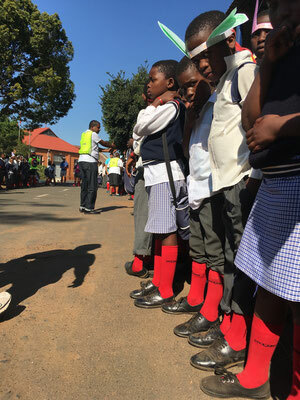 The children of the Umsilinga Primary School. All children in red socks with little handicrafted rabbit ears everywhere!!! 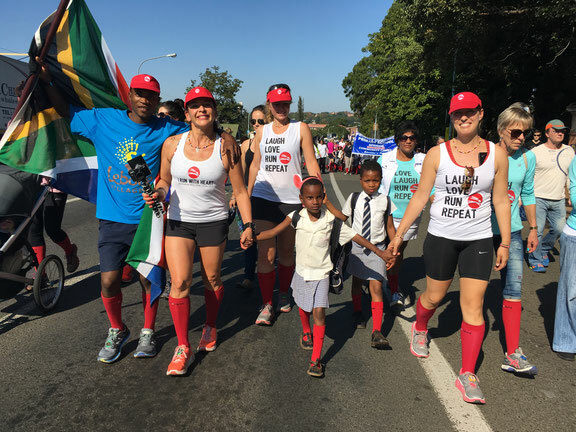 The red socks are our reminder to “stay positive, to make a difference, and follow our hearts.” Unogwaja' is the zulu word for 'hare' (rabbit). I have not seen so much joy and beautiful energy for a long time. John had asked us to try doing a formation with them as we´d wanted to welcome the 12 Unogwajas after their last cycling kilometres . 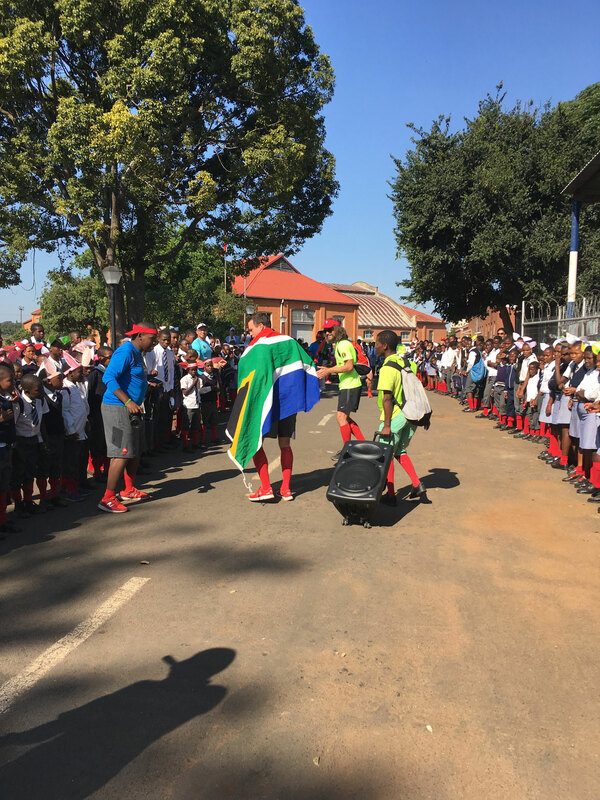 Seeing the faces of the kids made us realize even more the importance of the Unogwaja Lightfund. Simple happiness - mindblowing. It puts everything in perspective again... 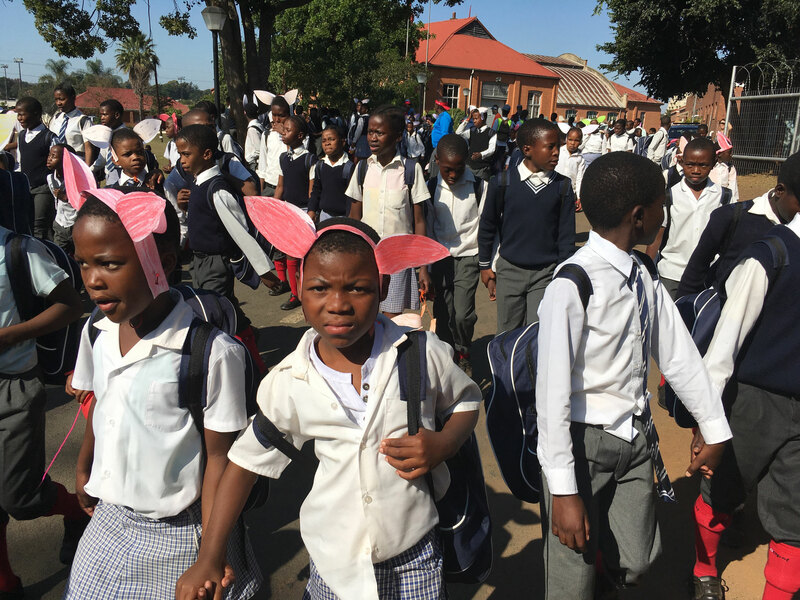 It was worth it: our months of fundraising here in Germany, trying to explain that we wanted to contribute to make a difference, to help these children towards their education, to get them a proper school. Suddenly we find ourselves amongst them! When the 12 Unogwajas finally rolled in - nothing could stop their joyful screaming! What an emotional welcome of 12 extraordinary people from all over the world having completed this difficult cycle following the brave steps of Phil Masterton Smith. 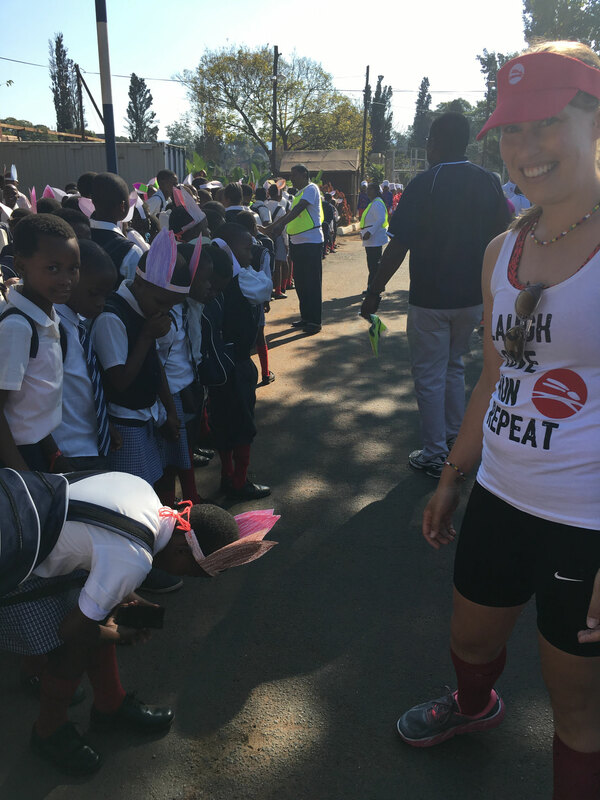 Then we walked through Pietermaritzburg – all of us! It was simply magic! 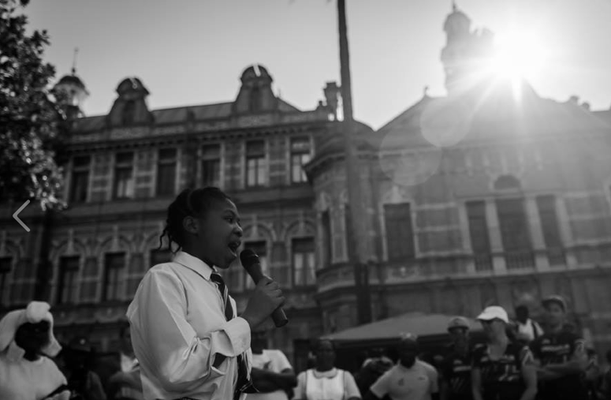 We all united at the City Hall and what most impressed me was a speech done by a girl called Bongiswa. 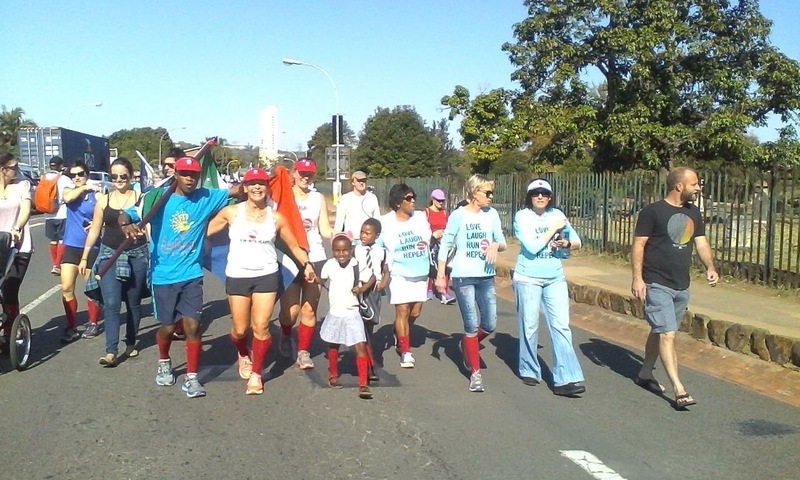 John and Brundle had met her during their last years walk from Capetown to Pietermaritzburg. Bongiswa wants to become a doctor. She stood up and recited Rudyard Kipling's "IF" in front of all of us. 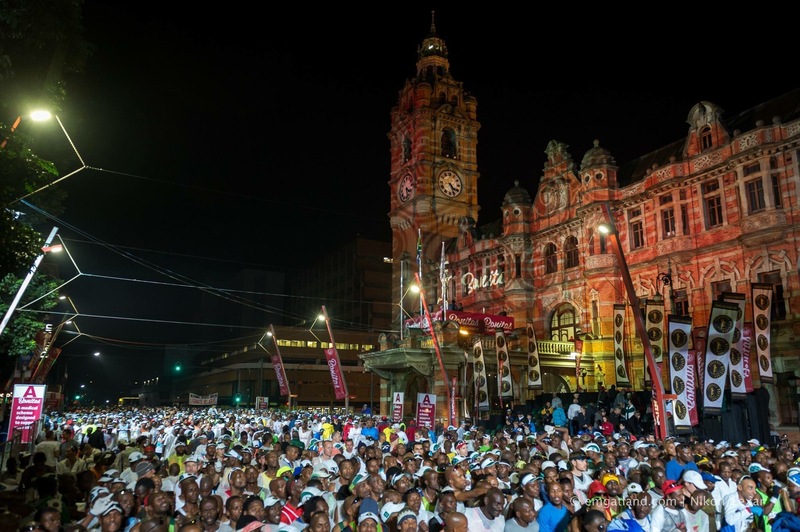 Goosebumps and tears… so beautiful! Shosholoza. Go forward. Go forward on those mountains train from South Africa. Go forward. Go forward. The spirit of the Comrades Marathon is said to be embodied by attributes of camaraderie, selflessness, dedication, perseverance, and ‚UBUNTU’. 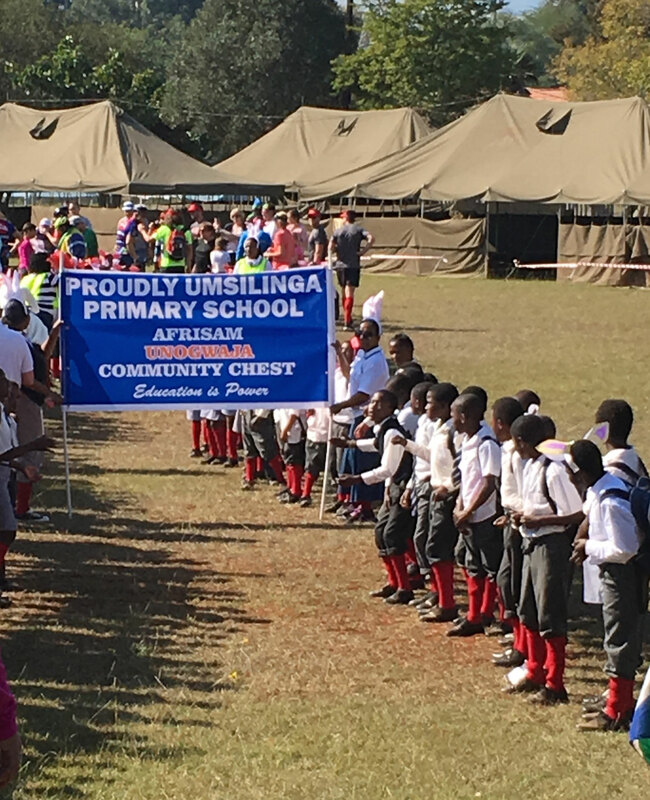 ‚Ubuntu’ is the zulu word for ‚human kindness’ and is often translated as ‚humanity towards others’, but is often used in a more philosophical sense to mean ‚the belief in a universal bond of sharing that connects all humanity’. At this point I didn´t know yet that I would experience exactly this ‚Ubuntu`. 5:30 pm The race starts with the traditional cockcrow by Max Trimbourne followed by a gun shot. 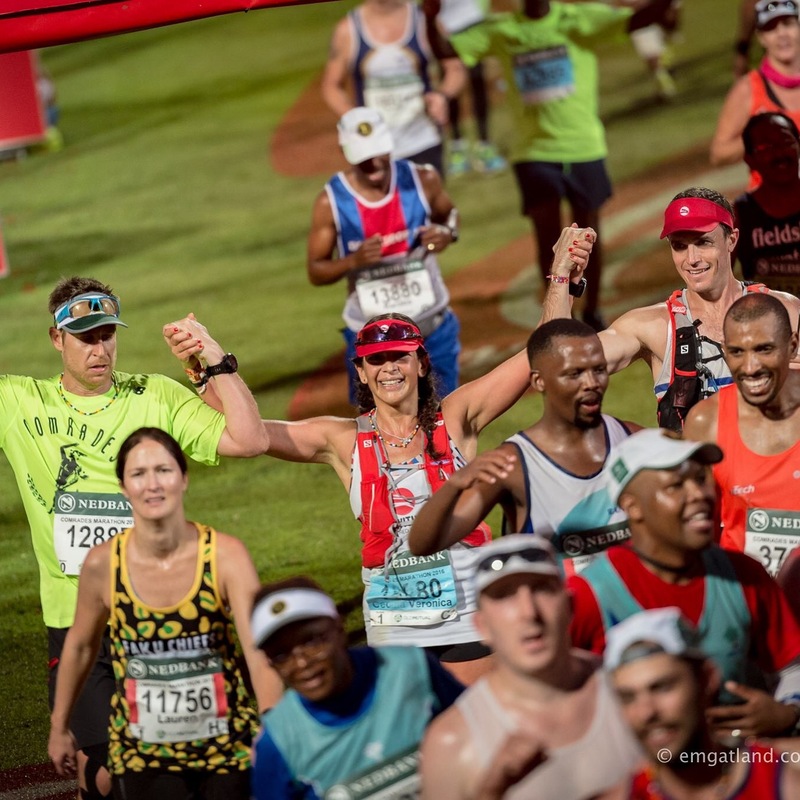 The distance alone makes Comrades intimidating. 89,2 k. The infamous climbs and dramatic drops make it torturous. From my last downrun I knew the rules... 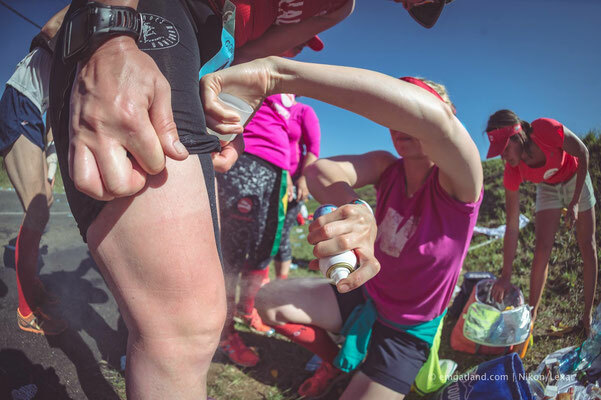 I guess I must have told Kerstin and Elke a million times how to accept the walking passages and being careful on the drops, how to drink, the extra salt, how to be careful with your strength. Comrades is hard on your body and mentally gruelling. It is your mind that will get you through those last third. We had done our homework, but we knew in marathon´s anything can happen. We needed to conquer the ‚big five’: Polly Shortts, Inchanga, Bothas Hill, Field´s Hill & Cowies Hill. 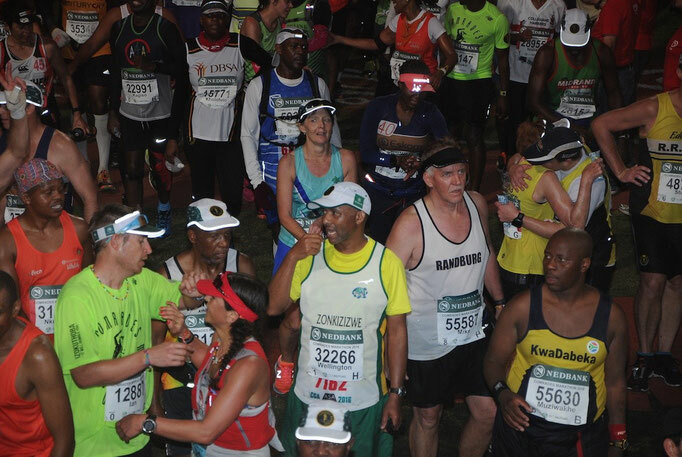 You have to run within a time frame of 12 hours – 5:30am till 5:30pm – no excuses – ist a ‚gun to gun-run’. 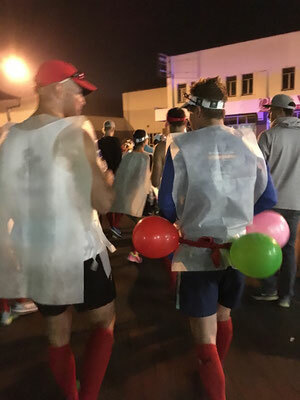 We started running in the dark. 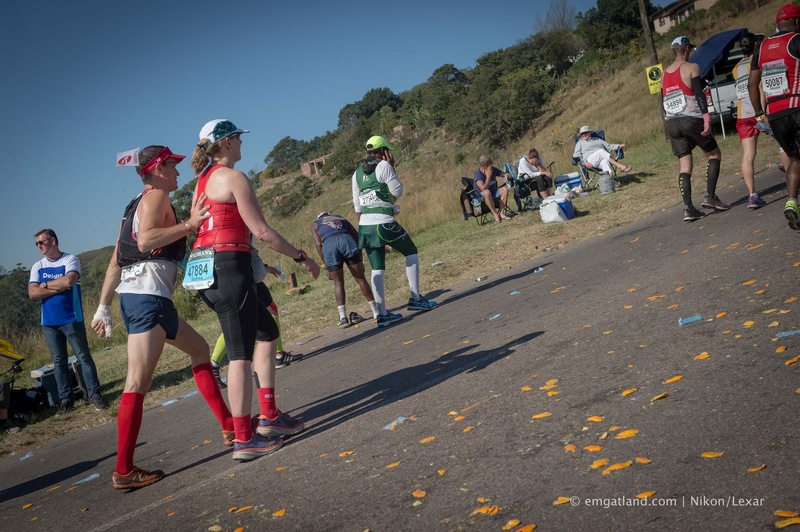 I needed to step out urgently as we had been standing over half an hour in our seeding block – after running back in I lost Elke and Kerstin but suddenly I found myself running next to Ian. 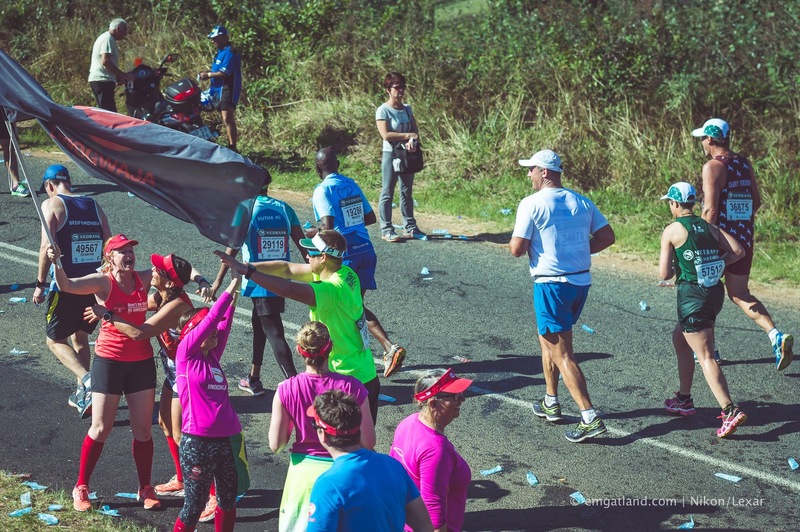 With 20.000 runners on the road its easy to loose your people. We decided to run together. I had Stoff´s words in my ear – he´d say one night before that the Unogwajas should stick togehter if possible. I understood. Comrades can be hard on you. 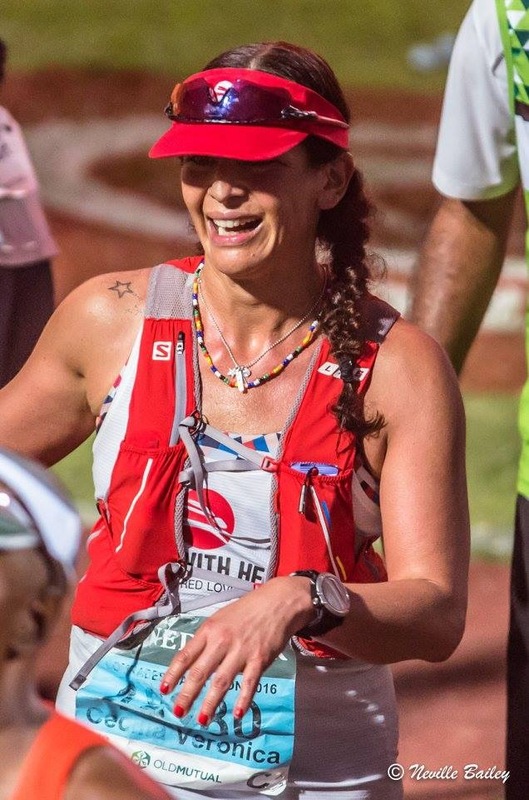 But for sure one will never run alone in this race. We ran into the sunrise always checking the pace. 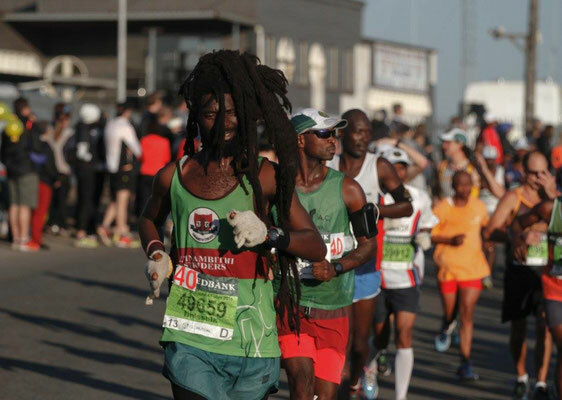 I am used to pacing other people as I have helped a lot of people to cross the finish line for the past two years. But only in marathons never in ultras – I promised we would finish. The atmosphere in Comrades is mindblowing. So many spectators that it never gets you down. 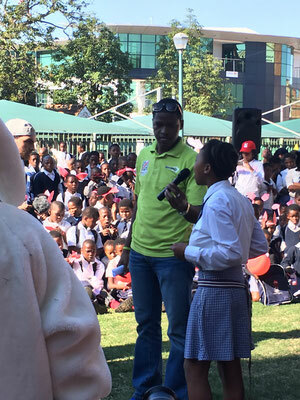 People singing Shosholoza, cheering and cheering your names. 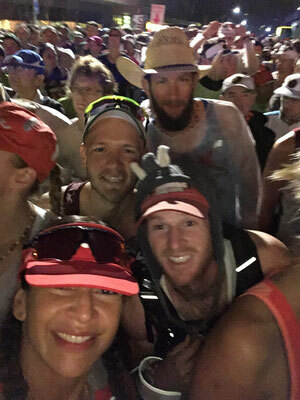 We bumped into Red Love Train buddy Trevor. We found ourselves singing `Oasis´s Wonderwall and Oh Cecilia` – keeping that mind busy and ‚alive’. At 60k it gets hard. The descent towards Durban is cruel, the streets never at one level.... everybody around us concentrating and focusing on their steps . 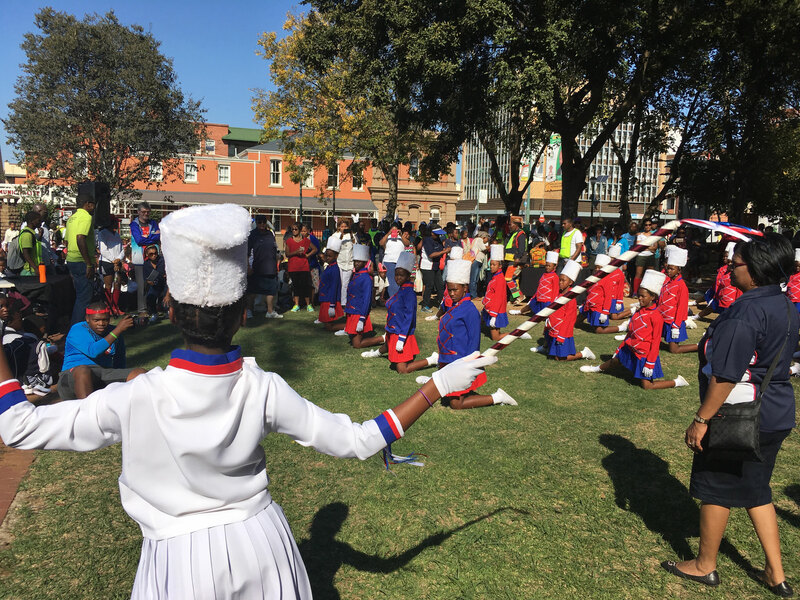 The ‚green mile’ just came at a perfect time – lots of music and celebrating spectators – the cheering really lifts you up when you get down! It felt like 30 degrees and the humidity was high. 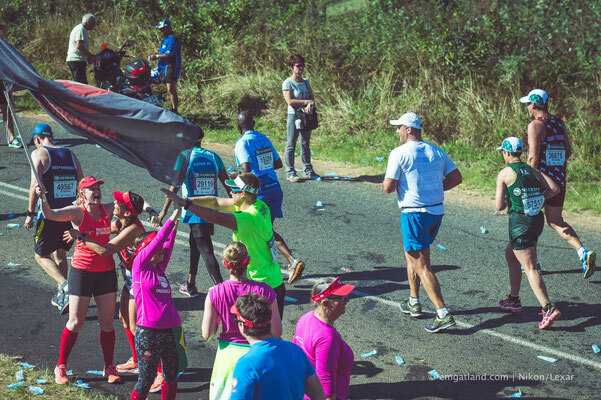 I remember getting an ice pop which was amazing as the temperature was cruel on me – I am not used to this kind of heat - nor the humidity. We´d use every opportunity to get as much water as possible for cooling our bodies down. 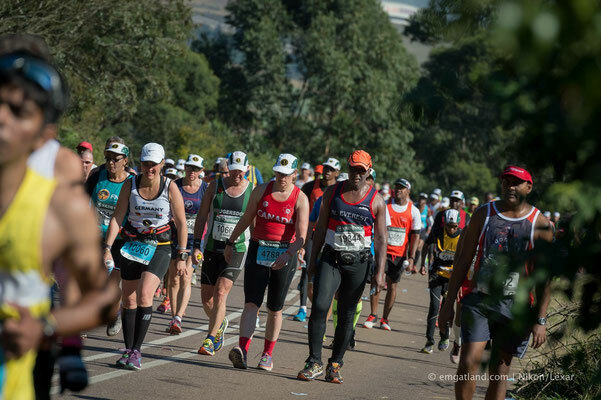 The last kilometres were a fight against the time. 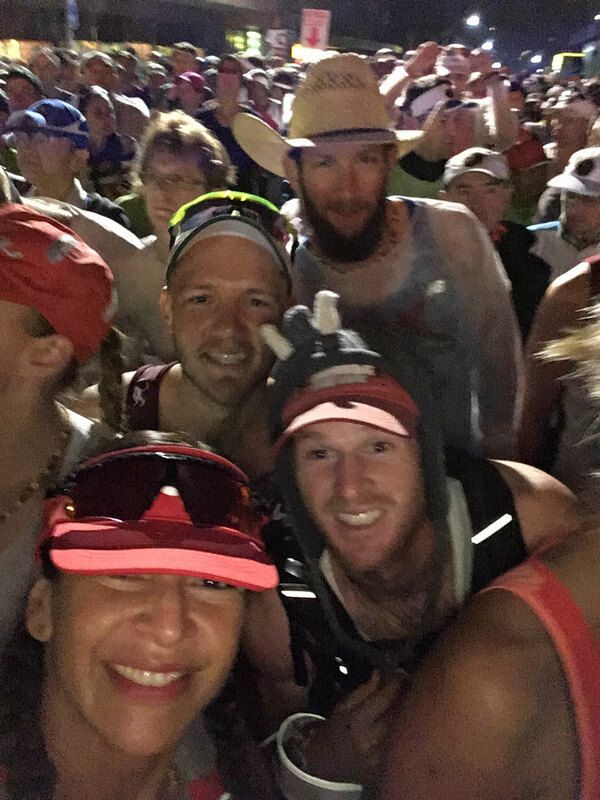 We needed to finish under 12 hours. Running down was hurting Ian bad. I must have gone on his nerves with my ‚mantras’ counting, singing and a lot of ‘yes we can’. 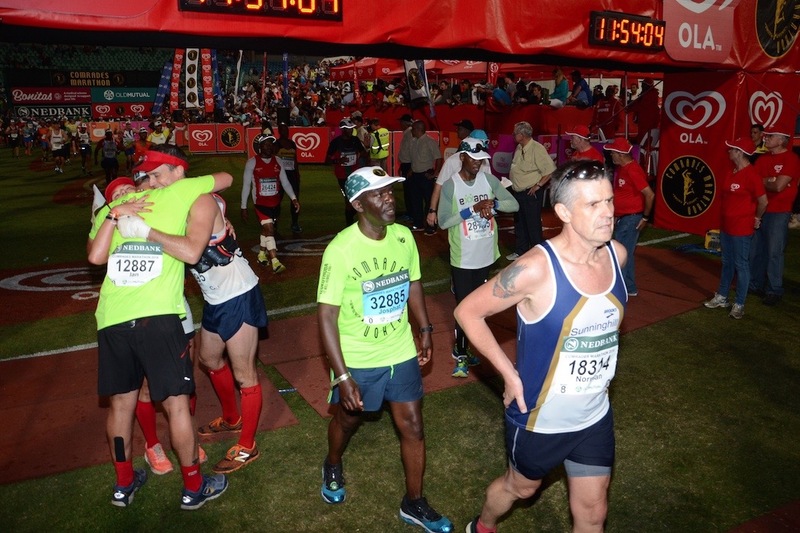 I was trying to give him my energy by grabbing his hand and talking to him and telling him to focus on us running through the finish line. Telling him that we would make it together. I had Stoffs words in my ear. We should rely on eachother. Then we bumped into John what a magic moment. I asked him about Elke and Kerstin – I was so worried as I did not know if they were in front or behind and how they´d feel. He assured they were doing really well last time he saw them, they were singing and laughing. I was so happy to hear that! 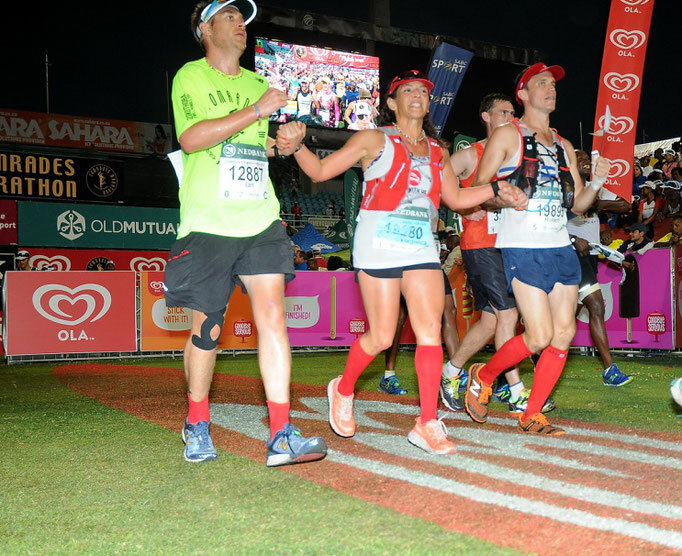 John was also helping a lot of our team mates, running back and forth at the same time cheering up people in the race. Incredible! He has this amazing aura! 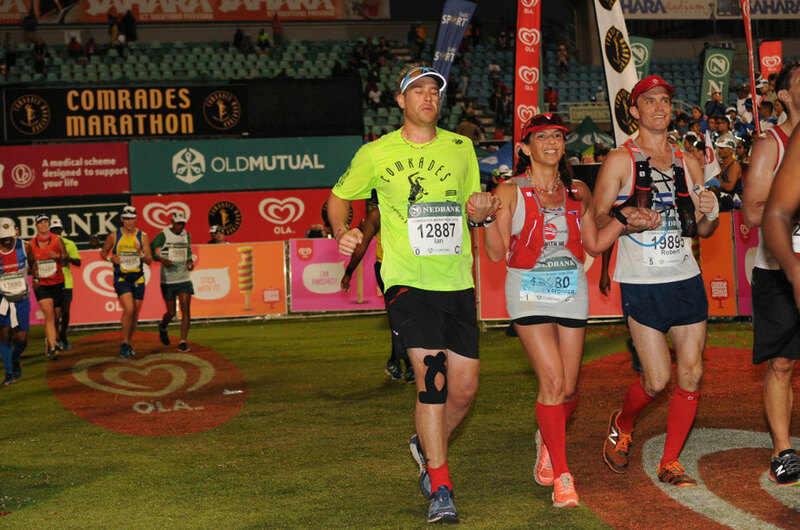 Sticking together, watching out for each other – this is what Comrades is! It was getting misty and darker. 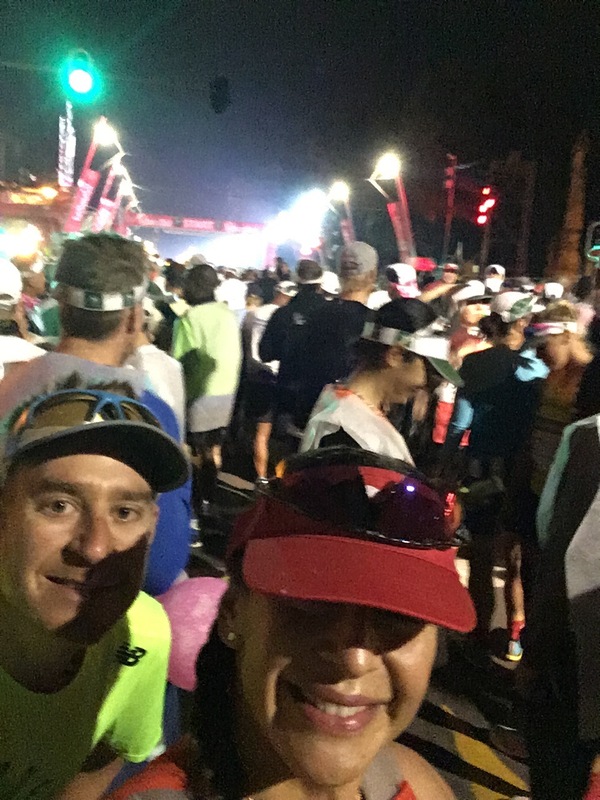 One km to go - we had finally passed the 12 hour 'bus' with appoximately 50 people running close togehter when we finally entered Kingsmead Stadium. Running into the stadium is mindblowing. People everywhere cheering and screaming - only 7 minutes till cut off! 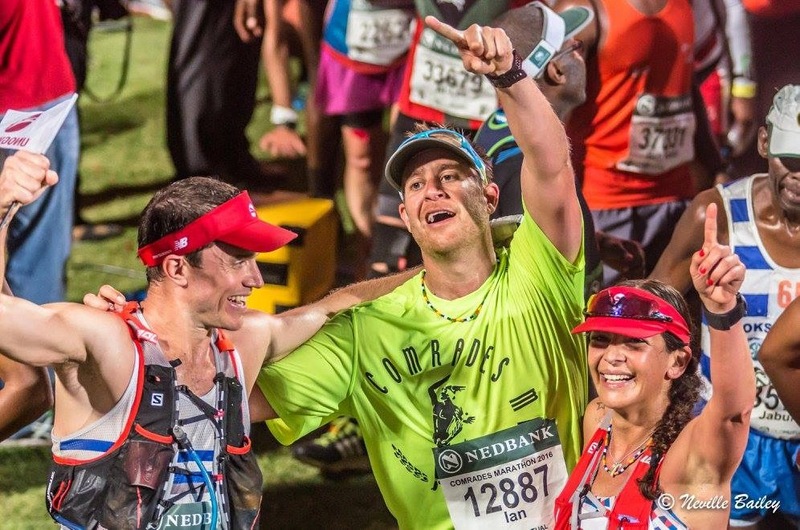 Seeing yourself on a huge screen coming towards the finish line is incredible. 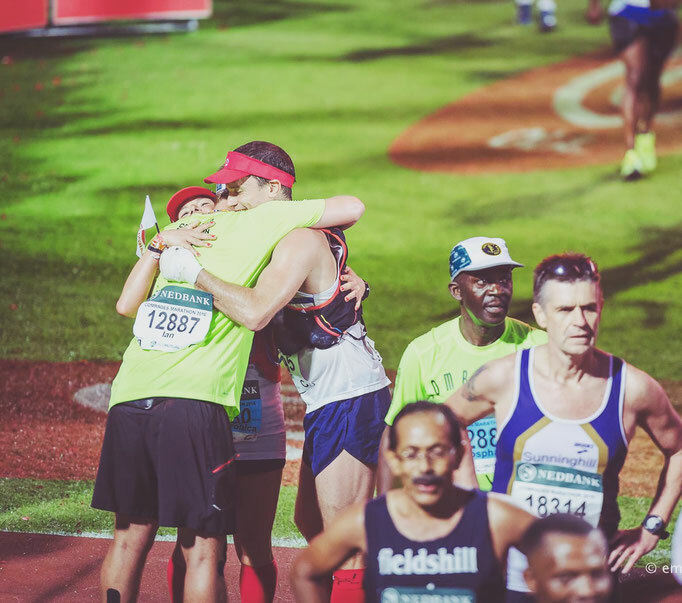 It was us – THE THREE OF US running hand-in-hand over that finish line... a super special finish with two most awesome humans I truely love. 11 hours and 53 minutes! 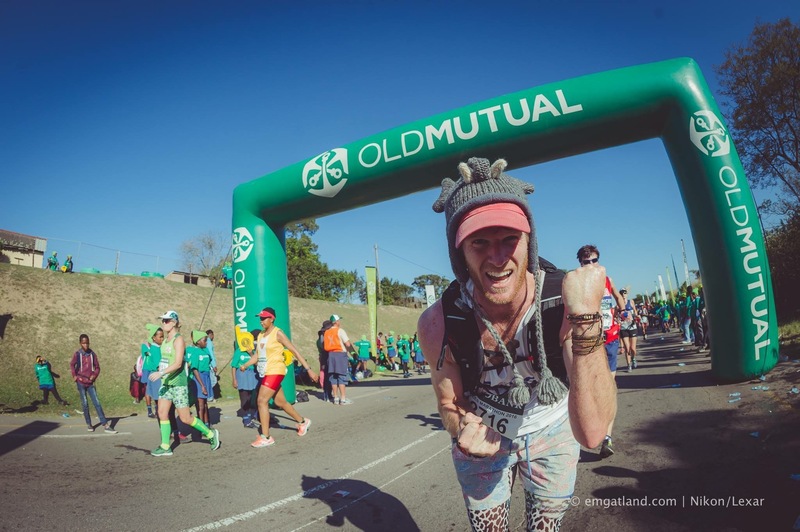 We had made it - a memory I will always carry in my heart! 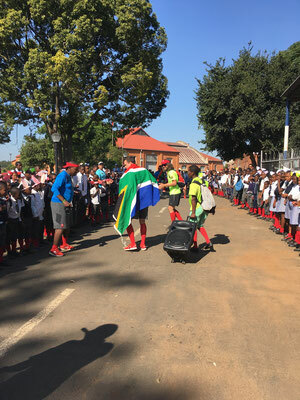 Our own ‚Ubuntu’. 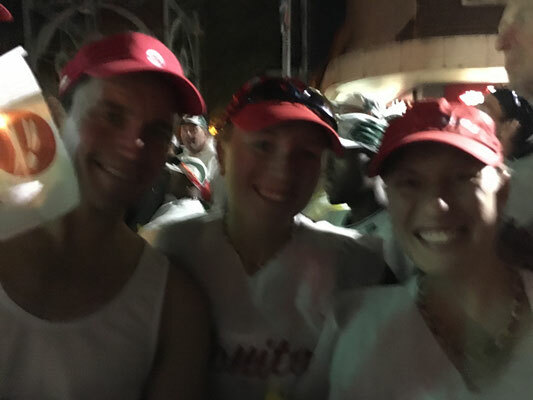 Kerstin and Elke finished at 11 hours:19minutes - I am so incredibly proud of them - they´ve done everything right and with the right spirit! 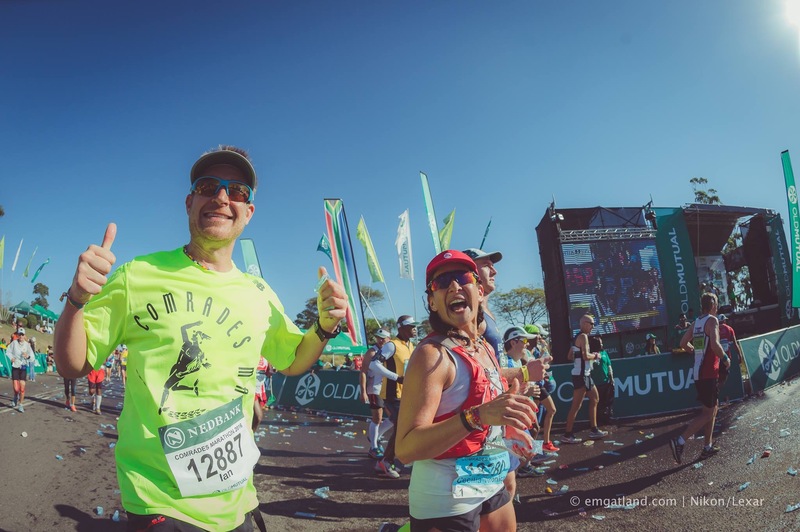 Needless to say that Comrades is hard on your body – but it changes you forever - every single step is worth a celebration. You get stronger. In many ways! Hopefully my dream will come true to be in the team in 2017! 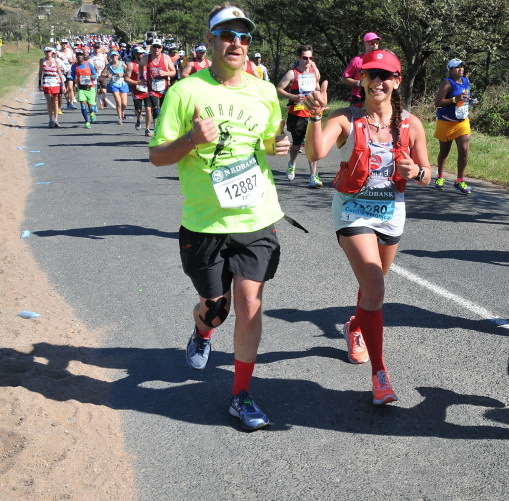 I ran with heart and I will keep this memory of this journey forever. It´s a treasure - worth more than I can express!